Provides replacement of your Kindle Keyboard 3G for any device failures under ordinary use. 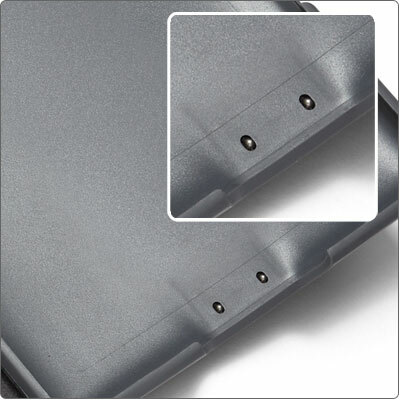 Adds accidental coverage so your Kindle is covered for mishaps like drops or spills. The plan provides coverage against accidental damage under ordinary consumer use for two years from the date of original retail purchase. Includes free shipping both ways, for your damaged and replacement Kindle (shipping within the U.S. only). Customer service and claim support available 6 am to 10 pm PT, 365 days a year -- call (877) 441-3836 for warranty claims. 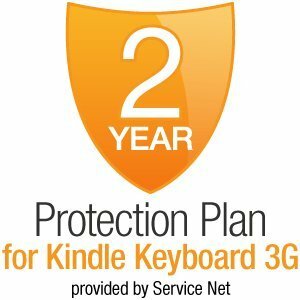 The 2-Year Extended Warranty is available for any Kindle Keyboard 3G shipped within the past 30 days. Only available to U.S. customers. In this writers humble opinion, and that of nationally recognized and syndicated consumer advocate Clarke Howard-- as well as Consumers Report-- this is a bad deal for you and totally unnecessary. First of all, IT IS NOT a complete 2 year extended warranty. Read the text carefully. They clearly say in print that it is only in effect AFTER your normal 1 year warranty that comes with the product. So, it is actually only a 1 year extended warranty for a mfg. defective product for $49 dollars. NOT a good deal on a quality product. Now, with that said, if you are a person who breaks everything you lay your hands on and are prone to dropping things out of your hands ( you admit you are a clumsy person!) then this might be a good thing for you. For most of us however, this is too expensive to make it a good deal. If they offered it at $19.95, it might be something to consider. Maybe. Subscriptions include full access to breaking news, articles, video, audio, multimedia, and blogs on NYTimes.com. The New York Times on Kindle is dedicated to providing news coverage of exceptional depth and breadth, as well as opinion that is thoughtful and stimulating. Widely quoted, and often hotly debated, The New York Times is held by its readers to the highest of standards and continues to be regarded by many as the nation's pre-eminent newspaper. The New York Times has earned an unprecedented 94 Pulitzer Prizes, far more than any other newspaper. A global news staff covers a wide range of interests: from world, national and New York issues to business, culture, science, religion, travel, style, food, sports, health and home. In addition to outside contributors, the editorials page features The New York Times' own team of award-winning columnists: David Brooks, Maureen Dowd, Thomas L. Friedman, Bob Herbert, Nicholas D. Kristof, Paul Krugman, Frank Rich and John Tierney. 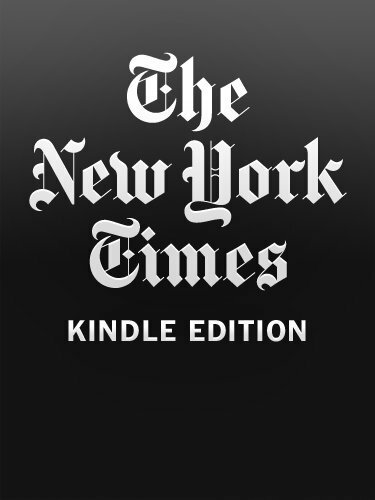 The Kindle Edition of The New York Times contains articles found in the print edition, but will not include some images and tables. Also, some features such as the crossword puzzle, box scores and classifieds are not currently available. For your convenience, issues are automatically delivered wirelessly to your Kindle at 5:00 AM on the weekdays and 5:30 AM on weekends New York City local time. I currently pay $35 a month for a six-day subscription to the print edition. The Kindle edition only costs $14 a month. So, if the Kindle edition of the NYT can replace my print subscription, the Kindle pays for itself in just over a year and a half and I get the Sunday NYT 'for free'. Beyond that, the Kindle edition doesn't involve killing trees or using noxious chemicals to turn them into paper, and beaming my paper to me every morning takes a lot less fossil fuel than trucking trees to a mill, trucking paper to a press, then delivering the printed paper to my driveway. Plus, I never have to go out in the cold or the rain to find my paper in the bushes or under my car; I should never have to deal with a missed paper, which happens once or twice a month with my delivery service; I never have to suspend delivery when I go on a trip; and my newspaper will actually go with me. So, I have a lot of incentive to like the NYT on the Kindle. Generally pleased with my subscription but VERY annoyed that, in contrast to the description that it will include NYT articles sans graphs, charts and crossword--what you're not told and I tried very hard to find out before ordering--is that several articles are omitted from each edition and sometimes the articles that are included abruptly end, chopping off the final few sentences or paragraph. Yesterday's Sunday edition (Aug 24) only had 3 articles from the Book Review--a fraction of that section. This flaw needs work fixing or NYT need to state the subscription contents clearly. My original review is now two years old, and I thought it's time for an update. Surprisingly nothing of consequence has changed. The Avantgo application that I refer to is no longer around. However I now just use the Times mobile site which has equivalent features; thanks to the Times for providing that service! I can view the Times' mobile site on my smartphone (which replaced my PDA) either thru wifi or over-the-air. Our sleek, form-fitted leather cover was designed to be the perfect companion for Kindle Touch. The premium leather exterior looks and feels great, while the soft microfiber interior protects your device from scuffs and scratches. 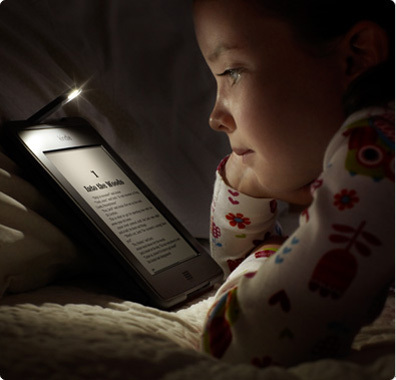 No matter where you take your Kindle Touch, you’ll never be without illumination thanks to the integrated reading light. Our innovative design allows the built-in LED light to draw its power from Kindle, so no batteries are required. An integrated LED reading light lets you read comfortably anytime, anywhere. The high-quality LED light is designed specifically for Kindle's paper-like display, adding brightness without adding glare. A permanent part of the cover, the reading light is located just above your Kindle Touch and is optimally positioned to provide an even light across the screen. When needed, simply flip the light out and it automatically illuminates, eliminating the need for a separate power switch. To turn the light off, just snap it back into place or close the cover. Since the light draws its power from Kindle, no batteries are needed. Our innovative cover interfaces seamlessly with your Kindle Touch, securing your device while providing easy access to the home button and power switch. Two small connectors draw power from the device to power the attached light. Our cover is designed specifically for yourKindle Touch and secures your device without any hinges or straps. Simply place your Kindle into the form-fitted interior of the cover and then gently press the device into place. Reading with the cover on, you can easily access Kindle’s home button and power switch, while the rounded edges offer a perfect fit in your hands. The reading light is easily accessible when the cover is open and the cover is designed to fold back, so you can read comfortably with just one hand. 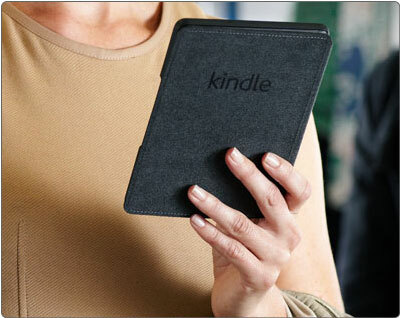 Thin, lightweight, and durable, this cover is perfect for taking Kindle Touch wherever you go. The stylish, genuine leather exterior and form-fitting interior provide ultimate fit and protection. You'll also never be without a reading light, and since the light draws its power from Kindle Touch, no batteries are needed. Amazon's official Kindle Touch lighted leather cover features a genuine leather exterior and microfiber interior, and comes in four different colors. Built-in connectors draw power from the Kindle device to power the integrated reading light. Protect your Kindle Touch on the go, and never be without a reading light. 1) The back. Mine is very thin leather, formed around what appears to be a rubber-like shell. In my opinion, the leather on the back looks pretty good. It's tightly form-fitting, and form-fitted and bonded to the shell, so I can see where some casual users might mistake it for plastic. It is in my opinion, most definitely leather. Is it "quality" leather? Well, I suppose so, but it'd also have to be extremely thin quality leather. 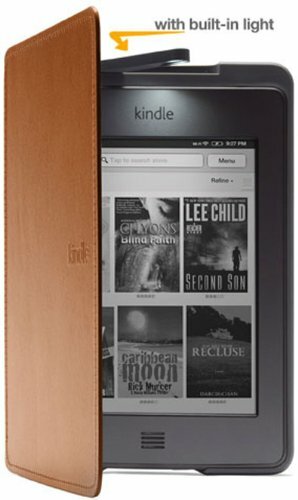 I preordered my Kindle Touch and Lighted cover on September 28th. Got my kindle day early but case shipment has been a mess. First there was no date for shipping. Then I got an estimate of December 22nd and in about 3 hours got a follow email that my case was to be delivered today. Case showed up an hour ago and as soon as it came in I attached my KT to it. I had original K3G with lighted cover before this one and its definitely a better design then earlier version. Kindle Touch weighs 7.3 ounces and Cover 5.4 ounces so its not light weight.